GIVE AWAY!!! For Paper Paws Swap Group ONLY!!! This is a card I made for a give Away. All you have to do is pick a number between 1 and 1000. I asked hubs to pick the number, write it down and slip it into an envelope. On October 22 I will reveal the winning number. If your number is picked I will mail this card to you. Easy Peasy, Lemon Squeasy! Now get picking! For this card, I used Distress inks on whisper white cardstock. I used a Ranger blending tool to apply ink in a circular motion. The pinks were applied to the upper portion of the cs leaving a pale space for the sun. I punched a circle in a piece of post it paper. Then used a yellow ink and the blending tool to make my sun. Then I tore the paper to make the misty yellow on the sides of the sun. I then used the blending tool and some green ink on the bottom portion of the cs. I used some rock stamps to stamp the rocks in a medium brown. Then I went over them with the highlight stamps in Momento Black. 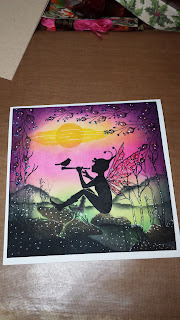 I then used the black Momento ink to stamp the Lavinia Fairy. JustRite Clear Multi-Step Landscaping Elements are the stamps I used for the trees, flowers, grass and rocks. All of them are in the one set. To make the mountains in the background, I tore a piece of computer paper. I laid the torn edge of the paper on my scene, using a dauber and the Momento black ink, a downward pulling direction I made the mountains. Using another Lavinia stamp I stamped the plants across the top working right to left. Then down the left side. I used the blending tool and purple distress ink I went around all of the edges of the cardstock. I added white gel pen dots and some Stickles to the wings of the fairy and the flower pods. I think that's it. It takes about an hour for me to create one of these. Let me know if you have any questions.